Posted 9/6/2018 10:48am by Cherry Valley Organics. Patty pan squash is quite unique. Its squat, flat shape, unique coloration, and ruffled edges might leave you scratching your head with wonder. What is patty pan squash anyway? Is it a winter squash or a summer squash? Do you peel patty pan squash or eat the rind? How the heck do you cook it? Today, we're going to fill you in on this delicious gourmet veggie and tell you everything you need to know about patty pan squash. What is patty pan squash and how is it different from other squashes? Much like zucchini, patty pan is a type of summer squash that's meant to be enjoyed while the skin is still soft and thin so there's no need to peel it. Its flying saucer-like shape is very distinctive and the scalloped edges of the fruits are the genesis of its other common name - the scallopini squash. Unlike some other summer squash types, patty pan squash does not have a high moisture content. The flesh is quite dry. Patty pans can be harvested for use as "baby vegetables" when they're as big as a ping pong ball, or you can leave them on the plants until they reach the diameter of a soft ball. But, don't wait much longer than that to harvest or the skin will no longer be smooth and edible. Patty pan squash come in many different colors, including yellow, dark green, white, pale green, and even bi-colors. But no matter the color of the fruit, patty pans are equally useful in the kitchen. Though they're considered a gourmet summer squash variety, patty pan squash are surprisingly easy to grow. Here at the farm we plant seeds directly in the field as soon as the danger of frost has passed in the spring. In Pennsylvania, that's mid to late May. The seeds are quick to sprout and the vines grow rapidly. 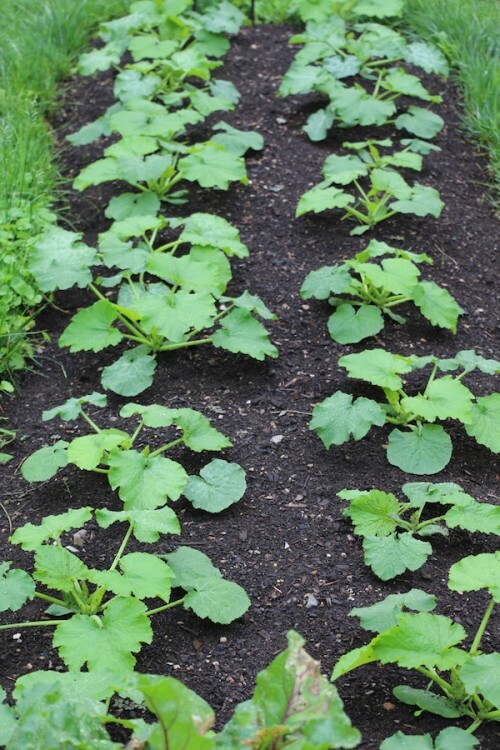 Patty pan squash plants are bush-types. They don't grow long, rambling vines like winter squash do. Instead, the plants spread just three or four feet wide with a height of about twenty-four inches. Most patty pan squash plants start to produce fruits about 45-55 days after planting, and harvests continue for many weeks thereafter. Jaune et Verte - This crazy patty pan squash is a creamy light green with deep scallops. It's so beautiful! Benning's Green Tint - A hybrid variety with glossy skin, this patty pan variety is a very pale green that matures to a bright white. Y-Star - One of the most fun types of patty pan squash, Y-Star is a bi-color. The top of the fruits are a brilliant yellow and the bottom end is lime green. Total Eclipse - This patty pan produces solid green fruits. With great flavor and high productivity, this is a staple variety on our farm. Whether you try your hand at growing your own patty pan squash or you purchase them from our organic farm via our Farm Share Program or at the Farmers Market, patty pans lend a lot of culinary flare to the kitchen. Patty pan squash tastes much like traditional zucchini, though the texture is a bit drier. Use patty pans in any recipe that calls for zucchini. They can also be grilled, fried, or roasted. One of our favorite ways to prepare patty pan squash is stuffed with seasoned beans, rice, and shredded chicken or pork and then roasted. We hope you enjoy the firm texture and savory flavor of patty pan squash as much as we do! Posted 10/23/2017 11:40am by Cherry Valley Organics. Of all the winter squash varieties we grow here at the farm, Delicata squash are a favorite among both our staff and our customers. The orange flesh of this variety is creamy and delicious. Plus, the unique exterior of the Delicata squash also sets it apart from other more-common winter squash types, such as Acorn and Butternut. Yes, you can roast or steam Delicata squash just like other winter squash varieties, but we find the best way to prepare this tasty squash is to turn it into a spectacular Delicata squash soup. 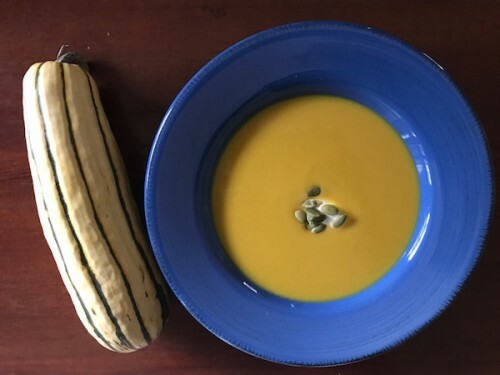 Below, we share our favorite Delicata squash soup recipe, but before we dive into how to eat this yummy squash, we'd like to tell you a bit more about why this squash is one of our favorites and how you can enjoy its flavor all winter long. Delicata is a specific variety of a North American native squash known botanically as Cucurbita pepo. Several other types of squash are also members of the same species, including zucchini, crooknecks, and patty pans, along with several types of pumpkins. Needless to say, it's a very diverse species! As you can see in the photo above, Delicata squash are elongated with a creamy yellow rind that's striped with green. The edible orange interior is full of fiber and potassium, along with several important vitamins and minerals, making this squash as good for you as it is delicious. There are several named cultivars of Delicata squash, each of which can be made into the Delicata squash soup we share below. Like many other squashes, the vines of Delicata squash can grow quite large and take up a lot of room, but to save space, you can grow a cultivar called 'Bush Delicata'. It has a bushier growth habit and shorter stems, making it possible to grow more plants in a smaller area. Whether you grow your own Delicata squash or purchase them through our Farm Share program or at one of our Pittsburgh-area farm market locations, know that these delicious squash will last for months, if stored properly. That means you can make Delicata squash soup all winter long from squash fruits that are harvested in September and October. Delicata squash, along with other winter squash varieties, are best stored under certain conditions. But in order to prolong their storage, the squash fruits need to be harvested at the ideal stage. Here at the farm, we make sure each squash is picked when it's perfectly ripe. Delicata squash turn from light green to creamy yellow and the stripes become a deep, rich green when the fruit is ripe. The rind also hardens at peak ripeness; when you press a fingernail into the skin of a ripe squash, it should be difficult to puncture. The vines also die back as the fruits ripen, and the fruit stems turn hard and brown. All Delicata squash are best harvested before a hard frost, and an inch or so of the stem needs to remain attached to the fruit to prevent rot. For maximum shelf-life, ripe Delicata squash should be stored in a cool room (about 50-55 degrees F) at a relative humidity of about 75 - 80%. Put them on a shelf in a cool basement or garage, but do not stack them on top of each other in a bin or crate because if one develops rot, the infection will quickly spread from one squash to another. The average shelf-life for properly stored Delicata squash is three to four months. 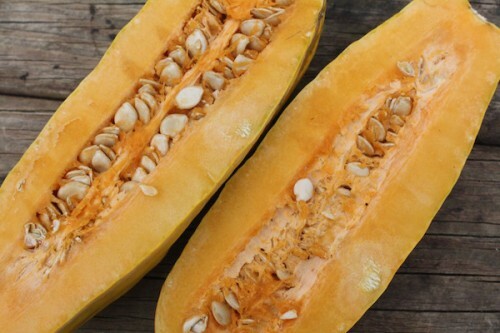 Now that you know everything there is to know about this amazing squash, it's time to get cooking! Here's our favorite Delicata squash soup recipe. It's quick to prepare, easy to freeze, and oh so comforting on a chilly winter day! Enjoy. Cut each Delicata squash in half lengthwise and scoop out the seeds. Place the squash halves cut side up on a baking sheet and bake until soft, about 35 to 45 minutes. Let cool, then scrape the flesh out of the rind. Discard the rinds. Melt the butter in a large pan over medium heat. Add onion, garlic, and ginger, and sauté until the onion is translucent and tender. Remove from heat. In small batches, combine a portion of the squash with some of the onion mixture and a portion of chicken stock in a blender or food processor. Blend each batch until smooth, then pour all of the batches together into a large stockpot and bring to a simmer. Slowly stir in the coconut milk and milk and heat through, but do not allow to boil. Add salt and pepper to taste. Serve with a dollop of sour cream and a sprinkling of pepitas. If desired, you can also add three tablespoons of yellow curry powder to the soup for an added kick of flavor. Also, if you like your Delicata squash soup a little thicker, reduce the amount of chicken stock in the recipe.